VIDEO: And you thought there were only brain-dead elitists in Hollywood. Check out this rocking pro-Trump street party! It may be the professional Hollyweird liars (after all they are paid big money to convince they are someone they are not) who get all the ink in the press and whose smug mugs are all over our TVs and the big screen, but apparently they are far outnumbered by real people, true blue Americans in Tinseltown. Check out this YUUUUUUUGE pro-Trump street party they threw over the weekend. Somewhere Ronald Reagan is smiling! HOLLYWOOD >> A giant throng marched a mile across Hollywood on Saturday to support President Donald Trump and his aim to “Make America great again,” reports Los Angeles Daily News. An estimated 100 pro-Trump marchers waded down Hollywood Boulevard to rally around the reality TV-president’s Hollywood Walk of Fame star. At least one kneeled to kiss the brass “Trump” etched in the sidewalk terrazzo. It was a refrain echoed by the Los Angeles Make America Great Again march in conjunction with similar rallies across 50 states. As they rallied in front of the Hollywood & Highland Center, the sounds of “Play that Funky Music” and “We Are the Champions” echoed from a supporter’s boom box. A “Trumpmobile” rolled up with a depiction of the 45th president backed by Jesus. “We are all ambassadors for Trump, and our Heavenly Father” artist Matthew Woods, 55, of Canoga Park and a member of event host Los Angeles County for Trump, had told marchers before the sidewalk parade. “Make everybody feel welcome. The Los Angeles rally started at noon near the Metro Hollywood/Vine subway stop. Marchers chanted “He’s our president” and “America First” as they passed through a double row of Hollywood t-shirt shops, pizza joints and landmarks such as the Egyptian Theatre, to the supportive honks of passing cars. A crowd of followers, meanwhile, shouted anti-Trump expletives. A fistfight broke out along the sidewalk when a man grabbed a Trump supporter’s hat. Los Angeles police on bikes arrested two men for possible assault. But instead of being met by an expected counterdemonstration and potential violence, marchers were met by mostly sidewalk sneers and jeers in largely Democratic Los Angeles. “Even zombies wouldn’t eat Trump,” declared Drake, a self-professed “Zombie man of 112th Street,” on a sign. 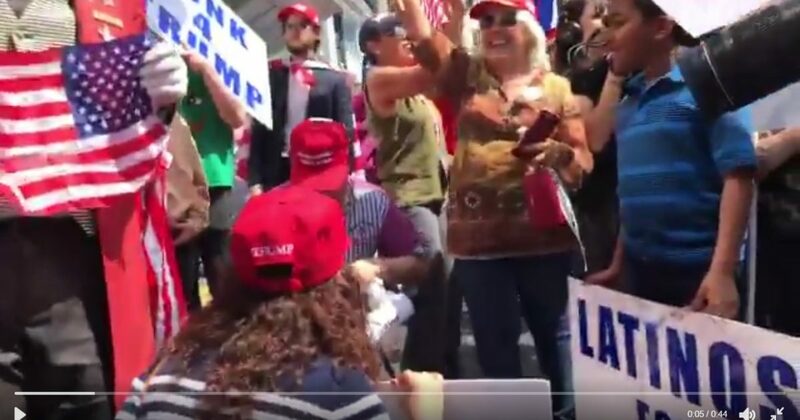 But as tourists gawked, Batmen and Supermen pranced and shopkeepers stared through storefront windows in silence, a diverse pro-Trump rally of whites, Latinos, blacks and more turned into ring-around-the-Trump-star party.